For tracing & locating active Ethernet network cables when even connected at switch/router and live phone line systems. Includes HUB Blink/Link feature for easy active Ethernet, cable and switch port identification. Easily trace & locate STP and UTP cables on active network and live phone line systems. Built-in RJ45 jack and RJ11 plug cables with alligator clips and included RJ45 to F adapter, makes it easy to trace LAN, Telephone, Coax, Security/Alarm and speaker cabling systems on any work environment even when terminated at a switch or router. The PR-60 has the unique features of enhancing output Net & Tel tones specifically for tracing and identifying active network cables on HUB/Switch or Router and live telephone line systems, as well as isolates cable and wiring within a bundle, despite cable bleed. 2. Determine phone Line 1(4/5) and Line 2(3/6) voltage and polarity. 3. Supply talk battery power to allow communication over inactive test sets. In continuity mode, when a short circuit is detected an audible sound will be heard. With low-battery indicator. 1. Built-in RJ45 jack for tracing active and inactive LAN cables. Use with included RJ45 to F adaptor allow user to trace coax, security/alarm cables. 2. 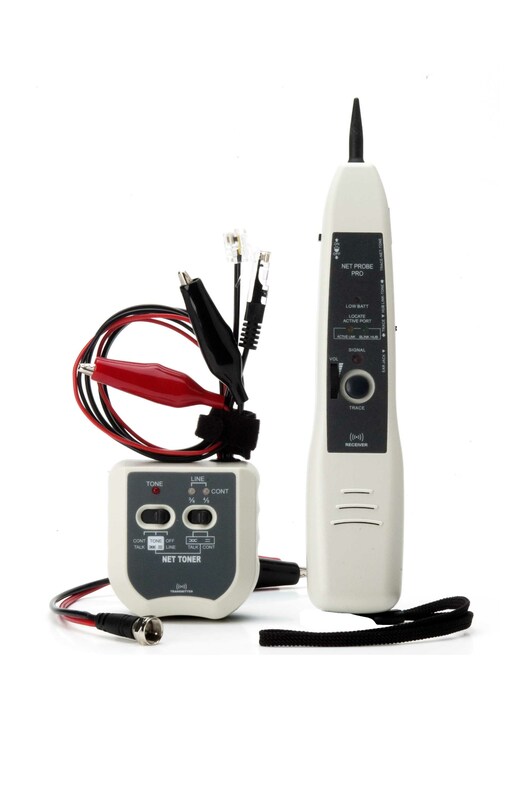 Uses the RJ11 plug cable to trace live phone line, verify Line 1 and Line 2 voltage & polarity. 3. Alligator clips for testing wire continuity, for toning on non-terminated cable, punch down blocks and for connection to supply talk battery power. The advanced Net & Tel tones for tracing and locating active network cables more effectively at switches, routers, patch panels, hidden within bundles, or termination blocks, as well as voice, audio and video cabling for any work environment, allows LAN and Telecom installers can quickly locate the right cable during installation and troubleshooting. The Net Probe comes with adjustable volume control and Ring/Tip polarity test indicators, an earphone jack for noisy environments, low battery indicator, easy tip replacement, and lanyards attachment point for hand-free operation. It is also equipped with a visual signal strength indicator for easier locating target wire/cable. The PR-67H comes with Net Probe Pro which takes all the features and functionality except Ring/Tip polarity indicator of the Net Probe, and adds useful features of active Ethernet port ID- Hub Blink and Link Mode for fast identifying the termination port of an Ethernet wall outlet or cable on the active network devices by blinking the Hub/Switch/Router link port light. The Link indicator for easier identifying whether an Ethernet outlet or cable is an active Ethernet port. It also has a built-in Flash Led Light can help you to find the target wire/cable in dark field. 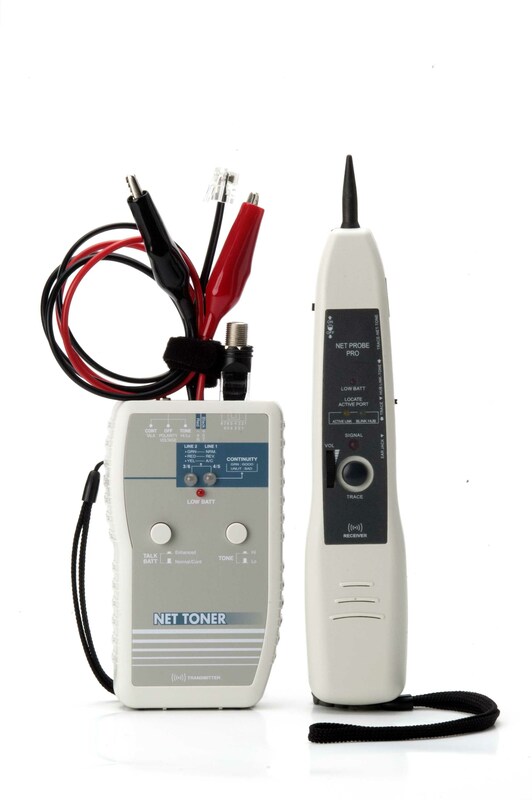 When used in conjunction with the Net Toner, the Net Probe allows you to trace and troubleshoot Telecom/Datacom, Security/Alarm, CATV and Audio cabling systems. This Kit is a must-have tool for installation, service and repair.